The Delphi D12S1R227-2D surface mounted, power block is the latest offering from a world leader in power systems technology and manufacturing — Delta Electronics, Inc. The D12S1R227-2D is the latest offering in the DXP30 family which was developed to address the ever-growing demands of increased current and power densities in networking applications while providing maximum flexibility for system configuration, its benefits CAN easily be applied to other applications transcending various market segments. The DXP30 family, containing all necessary power components and boasting of a USABLE (55˚C, 200LFM) current density of 60A/in2 and a power density of up to 216W/in3 , is a building block for a new open Digital Power Architecture developed to work with either digital or Analog controllers. Measured at 0.5”Wx1.0”Lx0.5”H and rated at 25A of output current, the D12S1R227-2D is designed to operate with an input voltage from 7V to 13.2V and provide an output voltage adjustable from 0.8V to 1.8V in digitally defined step resolution of 1.62mV. 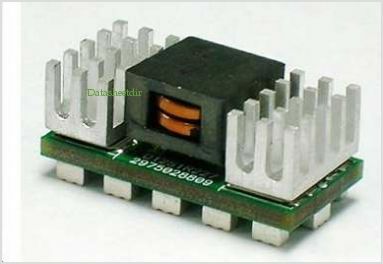 Multiple D12S1R227-2D CAN be used in parallel to serve applications where output currents are in excess of 25A with limitation imposed only by the control circuit, Analog or digital. Designed for superior price/performance, The D12S1R227-2D CAN provide 1.8V and 25A full load in ambient temperature up to 55˚C with 200LFM airflow. By Delta Electronics, Inc. This is one package pinout of D12S1R227-2D,If you need more pinouts please download D12S1R227-2D's pdf datasheet. D12S1R227-2D circuits will be updated soon..., now you can download the pdf datasheet to check the circuits!